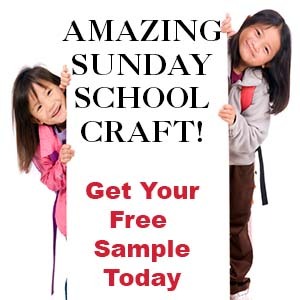 The following Sunday School lesson is a free sample Sunday School lesson. 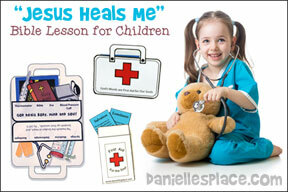 A complete lesson is available to members on The Resource Room. 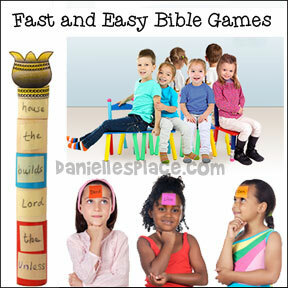 Print out the cards onto card stock, write the Bible memory verse you choose on the cards, copy them and cut them apart, and send one home with each child. 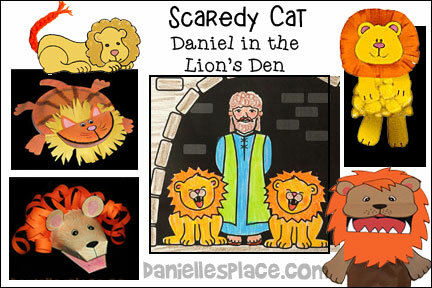 Children learn how to overcome fear through this make-believe story about a little, scaredy-cat lion who meets Daniel in the lion's den. For this craft you can use a gift bag or a plastic sandwich bag filled with yellow pom pom balls or wadded up tissue paper. 1. Before class print out the lion head pattern and the body pattern. 2. Use the pattern for the mane to cut out of orange construction paper. Cut slits all around the perimeter of the mane before gluing the lion's head on top of the mane. Use patterns to cut arms and legs out of yellow construction paper. 3. In class have the children color and cut out the lion head. 4. Glue the head in the center of the mane (mane should have the long side going horizontal). 5. Cut tiny squares (2" X 2") and scrunch up to make little balls, or use small pompom balls. Place the balls into the plastic bags. Fold the top corners of plastic bags down and staple them closed. Staple top of bags closed. Staple onto the back of head. Staple arms under mane. Staple legs to back of the bottom of bag. This craft just used noodles glued to paper. I bought these noodles at Wild Oats (a health food store). 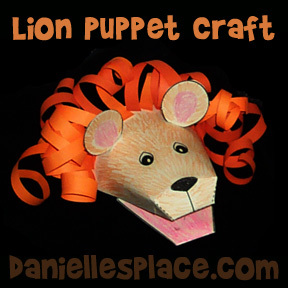 Use this craft with the lesson on Daniel and the Lion's Den preschool children or the lesson for Primary Children. 1. 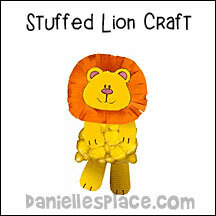 Before class print out the lion head pattern onto card stock and make copies. 2. If you would like the noodles to be orange, place some red food dye in a large Ziploc bag, add about a 1/4 cup of rubbing alcohol, and place the noodle inside. Lightly shake the bag until the noodles turn orange. Remove the noodles and place on a paper towel to dry. 3. In class have the children color the lion face and mane and then glue on noodles. 1. Print out the patterns for the top of the head and the jaw onto cardstock. 2. Cut out the patterns on the solid lines. 3. Starting with the top of the head pattern fold back all the dotted lines. Crease the faint lines that connect to the nose. Glue the A Tabs over the corresponding B Tabs. Then bring down the sides “Cs” of the head and glue them over the A Tabs covering the dark area. 4. To make the lower jaw, fold back on all the dotted lines except Tab F to make an envelope. Fold up Tab F. Glue the D tabs down to the inside of the envelope. Fold the top tab away from the opening in the envelope. Glue Tab F onto the inside of the lion’s head so that the opening of the envelope is facing outward. The child should be able to put his fingers in the lion’s head and his thumb in the lion’s jaw and open and close the mouth by moving his fingers and thumbs away from each other. 5. In class show the children how to cut long strips of construction paper about 1/2” thick (Or cut them before class). Have them curl the construction paper strips around a pencil or crayon and then glue them to the head. To finish glue the ears on and color the puppet. 5. In class show the children how to cut long strips of construction paper about 1/2" thick (Or cut them before class). Have them curl the construction paper strips around a pencil or crayon and then glue them to the head. To finish glue the ears on and color the puppet. 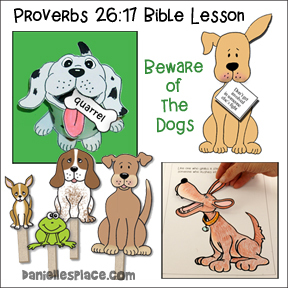 This lesson was designed to go along with ABC worksheets using the Bible verse. Children practice writing the letter C in print or cursive or write the complete verse in cursive. It was especially dark and cold in the pit this evening. The pit lions were not in a good mood. It had been many days since they had been fed. One particularly big lion called Bruno was tossing and turning trying to get comfortable, but his stomach was growling louder than he ever could. "I'm so hungry I could eat a horse!" he whined. Another lion that wasn't as big as Bruno but was just as mean grumbled, "I'm so hungry I could eat you!" Oh, quit whining, I'm tired of listening to you guys. All you do is whine," said another lion. "Besides, I heard that we just might be getting some dinner tonight." "You did?" Bruno asked hopefully. "Yep, I heard the King's men talking. They said that they tricked the king into making a new law, a law that says that if anyone prays to anyone but the King, that he would be thrown in the lion's den. Do you know what that means?" "No, what does that mean?" asked Leo, a not so bright lion." That means that we will soon be fed dinner. Everyone knows about Daniel. You can see him praying every morning and afternoon and evening on the roof of his house. He says that his god is the one and only God. There is no way he is going to pray to the king. So, if he prays this evening like he always does, that means we get dinner!" Not long after that the lions heard the clanking of the pit door. It opened slowly and then a man was thrown down into the pit with them. The lions gave out a roar so loud that it would have scared the pants off of anyone, but not Daniel. Daniel just stood there and stared at the lions. The big hungry lions opened their months and came closer to Daniel, but Daniel didn't try to run or cower away. He just bowed his head and prayed like he always did when things weren't going well. The lions didn't know what to make of this. They never saw anyone act like this before. But that didn't stop them, they inched forward. But something amazing happened when they tried to roar again, they couldn't open their mouths. There mouths were clamped closed tighter than a lid on a Tupperware container. No matter how hard they tried, they couldn't get them opened. Now the lions were scared. They ran away and hid in a corner of the pit. That's when Daniel heard it, a tiny cry like a kitten coming from another corner of the pit. Daniel walked over to the corner. When he got a little closer he saw a tiny lion cub cowering in the dark corner behind some rocks. Daniel spoke softly to the little lion, "It's okay, little fellow. You don't have to be afraid. I won't hurt you." The little lion liked the sound of Daniel's voice. It was very soothing. Daniel spoke again. "What's your name little lion?" The little lion answered him between sobs, "They call me Scaredy-Cat." "Why do they call you Scaredy-Cat? That isn't a very nice name to call someone?" The little lion answered, "Because I'm afraid of everything." "Everything? Nobody is afraid of everything." said Daniel. "I am, I'm afraid of everything." "Well, I'm afraid of the dark, and being alone, and people, and other lions, and mice, and spiders, and dirt, and the clouds falling on me, and getting hurt, and getting lost, and monsters, and snakes, and . . ."
"Oh, that is a lot of things to be afraid of, but that isn't everything." Then the little lion asked, "How come you weren't afraid of the big hungry lions? Everyone is afraid of them." Daniel answered, "Because I knew God was with me. He has helped me before and I knew he would help me now. You see God is my special friend. I can talk to him anytime of the day because he is always with me. Whenever I am scared or confused, I just stop and pray and he comforts me. I have learned to trust him over the years." "Were you always this way?" asked the little lion. Daniel answered, "Oh, no, not always. I was once little like you. I had many fears, but I learned that God loves me and that no matter what happens he will be with me." You see, little lion, the more you get to know God, the more you understand how much he really loves you. And when you understand that, you understand that God will always be with you, no matter what happens. This made the little lion feel much better. Daniel talked to the little lion all night and told him all about his God and how loving he was. When morning came the big door opened with a moan. The king peeked through the door. He yelled, "Daniel, Daniel, are you down there?" Daniel yelled back, "Yes, King Darius, I'm still here." God has protected me from the mouths of the lions." The King was so happy! He gave Daniel a great big hug and helped him out of the pit. Daniel looked back as he was about to leave. He yelled down to the little lion, "Remember, God loves you and will take care of you." The little lion wasn't so scared anymore. He looked over to the other corner and the big, hungry lions were still cowered in the corner with their mouths closed. Somehow this made the little lion feel even better. Have you ever felt like this little lion? All of us are afraid of things sometimes, aren't we? Scaredy Cat had lot of fears, didn't he? (Let your children share their thoughts.) You may even want to share what you were afraid of when you were little and how you learned to trust God to take care of you more and more as you grew older and learned to know God better and better. Dear God, Help us to learn to trust you more and more each day. Help us to be aware of your love and kindness for us. We know that your love is perfect and we don't need to be afraid. Before class make the lion craft pictured with paper plates. 1. Cut out legs, ears, and a tail from one paper plate or a styrofoam tray. I cut the feet from around the rim of the paper plate so that they naturally bend down. Try not to have the feet and tail stick out too far. This makes it harder to spin because the tail and legs keep bumping on things. 2. Glue or staple the legs and tail to the top of one plate. 3. Cover that paper plate with another paper plate to form the lion's body. The plates should be glued or stapled top to top. 4. Fold the small plate in half to form the cat's head. Glue the ears to the head at the fold. Glue the head to the body. 6. Write questions about the lesson on small cards. 7. Secure the cards with a large paper clip or clothespin. 8. Practice spinning the lion before class. 9. If you are not using the cards in the mouth, glue a small rock or something heavy on the head side of the lion. This will make the lion easier to spin. Make up some cards with questions about the story written on them. Add some cards with activities written on them such as "Roar like a lion", "Walk around the outside of the circle acting like a lion", etc. Have the children sit in a circle around the lion. The teacher will spin the lion. The child who is directly in line with the lion's face has to answer a question or do something that is written on the cards. If you would like, you can place the cards in the lion's mouth and clip them on with a paper clip or clothes pin and have the children remove one card when it is their turn. You can also make up your own games using words or math problems depending on what your child is learning at the time. 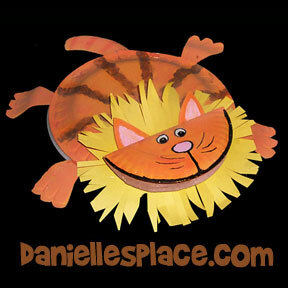 If you don't want to make the lion paper plate spinner, you can use a paper lion spinner. Print out the pattern onto card stock and color it. Cut it out and punch a hole in the middle. Use a paper fastener to attach to another piece of cardboard or use a thumb tack and stick it to a box. The lions in the den go roar, roar, roar, roar, roar, roar, roar, roar, roar. Daniel's in the den praying to God, praying to God, praying to God. Daniel's alive jump up and down, turn around and sit down. (You can have the kids just roar or snore using sounds if you don't want to repeat the words roar and snore so many times). This little book is in the shape of a lion. The tail is made from yarn. 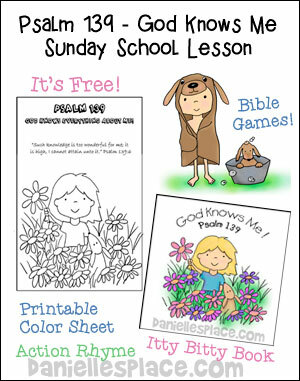 Children can print Bible verses inside that will help them not to be scared. Print out the cover pattern and cut them out. Use the cover to trace a back cover and pages. Staple them together at the top of the head. 1. Write a word rhyming with cat on each page. 2. Have children write their own story in the book. 3. Have a child dictate their own story to you to write for them. 4. You can also write other words that start with the C sound in the book. 5. Make it a prayer book. Help the children come up with a prayer they can pray when they are scared. I took the paper plate lion idea. I used a yellow Styrofoam plate. (I think as the colors appear thru out the year for the seasons I am going to stock up for crafts.). Then I took a plain white paper plate and spray painted both sides yellow. It was quick and easy. I folded them in half with the inside of the plate out. I cut the outside edge off on the upper half and folded the remaining circle center down. I then positioned the cut out edge where it was even with the folded edge. It over lapped the bottom rim. I stapled the top and bottom rim together at the corners and trimmed the excess off to where it was a smooth oval. This made the 'mane' to my lion with no additional materials. I cut out legs, tail and ears, and a tongue from construction paper. The ears were positioned right behind the fold at the top of the head. I also cut out a big red tongue (thought about teeth to go under the top of the mouth but didn't have time) and got a big punch of a heart and cut that out of pink for the nose. I went to makingfriends.com and ran off the eyes from one of the yarn bugs and cut them out for the eyes. Each was put place together with a plate so all could be handed out to each child for their craft. I did the memory verse on a business card with a small lion in the corner and that went in the mouth. We used glue sticks for everything but the legs, and tail. Those we stapled because they didn't hold. We have glues sticks for each child and it is working well. They stick quick, not drying time or mess. Even the three year olds do well with supervision. They turned out really cute. If you had the time you could add yarn or construction paper whiskers and tassel for the tail. I told both stories. 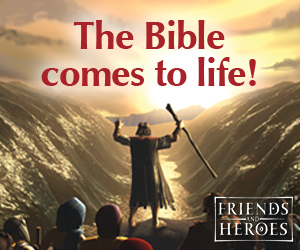 The Bible one first Daniel shows courage then did the scaredy cat one and told them we were pretending this might have happened because so many that are young take these things as in the Bible. We also sang, "God is bigger than the Boogie Man", from Veggie Tales and inserted things they were afraid of in the place of boogie man and monster. Showing the veggie tale movie Where is God when I am scared would be good before as an addition to this lesson. The king told everyone to "Pray to my idol, pray to it, for thirty days." Daniel said, "I can't, I only pray to God, only pray to God, only pray to God". Daniel said, "I can't, I only pray to God, all of the time." The king said, "Then you have be a lion dinner, have to be a lion dinner, have to be a lion dinner." The king said, "Then you have be a lion dinner because you won't obey me". Daniel was thrown in the lion's den, lion's den, lion's den, lion's den. Daniel was thrown in the lion's den, clank, clank, clank. Daniel's stayed alive so clap your hands, and sit down. The lions in the den went roar, roar, roar, roar, roar, roar, roar, roar, roar. The lions in the den went roar, roar roar, they were very hungry. Daniel started praying to our God, to our God, to our God. Daniel started praying to our God, to protect Him from all harm. God answered prayer and shut their mouths, shut their mouths, shut their mouths. God answered prayer and shut their mouths so they couldn't bite. Daniel stayed alive, so jump up and down, shout real loud, turn around. Daniel stayed alive so clap your hands, sit down. I used the Scaredy Cat lesson Sunday with my kindergarten class. The story is so fresh and relevant, and the Scaredy Cat Hand Puppet is wonderful. Here is what I learned from assembling him: (1) Two-sided tape is the best way to fasten the parts. They are hard to reach with a stapler, and it is hard to hold the parts in place while waiting for glue to dry on card stock. The tape is fast, easy, and fast holding. (2) While working out the details with my grandson, he put the ears on with a downward slant, and it made a cute puppy dog. This pattern would be great for several animals, depending on the ear placement.